A belated happy Earth Day to all. We went kinda "off the grid" last Friday, in honor of Earth Day, and thus found it somewhat difficult to get a DIY Friday post published. We had it all ready to go, but that whole smoke signals set up didn’t quite work. So, here’s our belated DIY Friday post, as the clock ticks down on Earth Day afterglow. 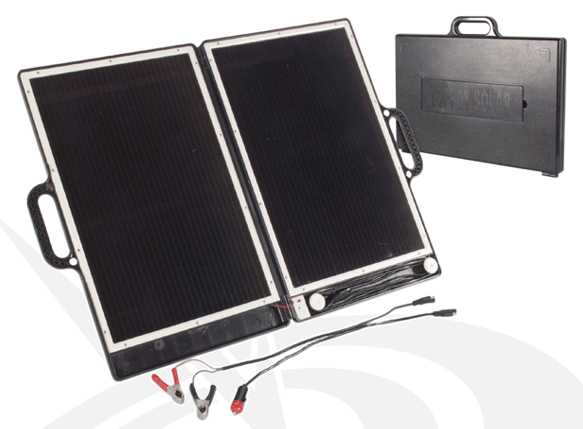 This first bit isn’t exactly a DIY project, but having a solar generating briefcase last Friday — like the one we spotted on ProductDose recently — might have helped get the DIY Friday post published. It’s handier than a gas generator, and so much less fossil fuel dependent. Besides, it generates more than enough electricity to power a laptop, so we could have charged up the iPod while we were at it. 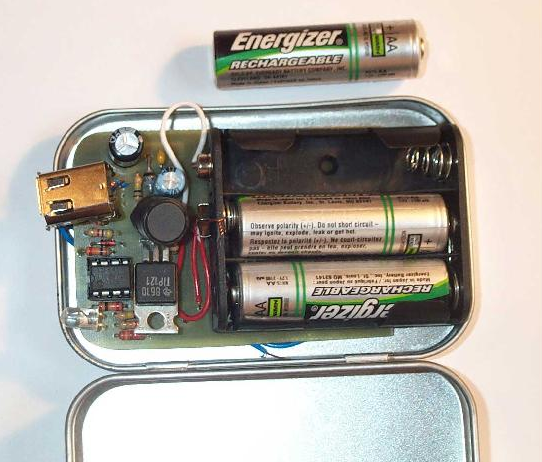 Speaking of iPods, this Altoid tin hacked into an iPod charger sounds like a good idea, if only the inventors could get it working. They cite a couple of reasons why it doesn’t, which I’ll post here in hopes that someone will be able to help them out. 1. The transistor doesn’t let enough current flow to fully charge the inductor. The other option is a FET, but a FET needs a minimum of 5 volts to switch fully on. This is discussed in the SMPS section. This device can provide a small amount of power to a USB or firewire device, but not enough to charge an (3G) iPod. It WILL power, but not charge, a totally dead 3G iPod. 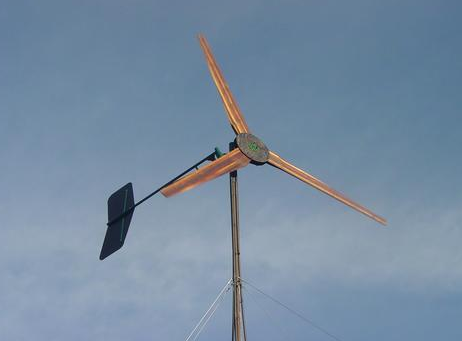 Meanwhile, as long as we’re on the subject of power, this homebrew wind turbine sounds like a pretty good idea. I don’t know how much power it generates, but I bet it will power a laptop and an iPod (probably) as the builder says he’s seen "3800 watts from it in a high wind." I’m not sure how much power that is, but he says he’s a bit more than he can use. 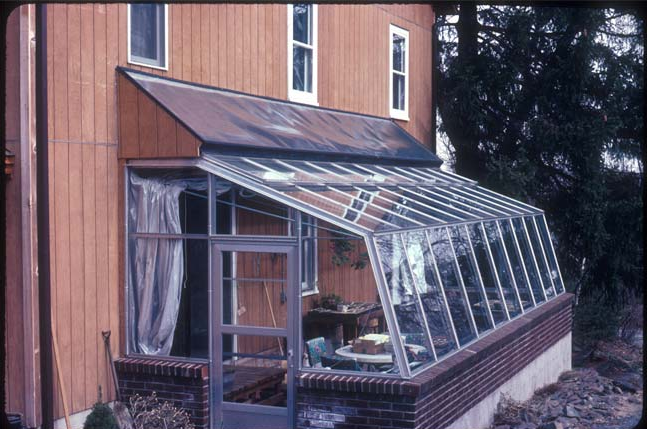 The guy who made the wind turbine would probably do well to team up with the David Mears — a professor of Bioresource Engineering at Rutgers University — who managed to hack his entire house into such an energy efficient mode, with adjustments including a woodstove and a solar enabled greenhouse (pictured above), that he and his family went 25 years without getting a heating bill. That’s also 25 winters of not burning fossil fuels to heat the house. That’s not just good for the pocket book, but good for the earth too. And that makes for a happy (though belated) Earth Day. Everybody’s talking about the big break-up. No, I don’t mean Nick and Jessica. I’m talking about Schwassmann-Wachmann, a comet that supposed to swung by earth next month, after it — according to one report — broke up for no apparent reason ten years ago. In 1995, Comet 73P/Schwassmann-Wachmann 3 did something unexpected: it fell apart. For no apparent reason, the comet’s nucleus split into at least three "mini-comets" flying single file through space. Astronomers watched with interest, but the view was blurry even through large telescopes. "73P" was a hundred and fifty million miles away. No apparent reason? Not exactly. Naturally, I’m not the guy with the answers on this. (Again, I refer you to the screen name.) But Phil over at Bad Astronomy has what seems like a reasonable explanation to me. The exact cause is a mystery, though there are plenty of reason why a comet would fall apart. Comets are made of rock and ice. When they get near the Sun, the ice sublimates– turns directly into a gas — and flows into space, which is why comets look fuzzy in pictures. The actual nucleus, the solid part, is very small, but the coma, the fuzzy part, can be thousands of miles across. It makes sense that after repeated passes of the Sun, enough ice is lost to venting that the structure of the comet can be fragile, since the ice in a way is holding the comet nucleus together. Once enough ice is gone, a breakup could occur if the sublimating ice builds up enough pressure to disrupt the structure. But that is just one explanation. The famous comet Shoemaker-Levy 9 broke apart because of the immense tidal forces of Jupiter’s gravity. Most comets don’t break apart; look at comet Halley, which has been circling the Sun for a long, long time (it was seen in ancient times). It goes to show that some comets are very fragile, and some are not. IMAS Publishing’s NAB Daily has a great set of stories covering events and presentations at the conference. The event was entitled, "New Distribution Pipelines: Turning TV Content Into Revenue." The keynote address, delivered by Anne Sweeney, co-chair of Disney Media Networks and president of Disney-ABC Television Group, focused the necessity of change to maximize opportunity. "Our industry is in the midst of a seismic shift," Sweeney said. Citing an earlier era when cable and home video first threatened broadcasters, Sweeney cautioned the audience against "old thinking." "Take heart, we have successfully overcome it in the past. We adjusted to the changing reality to reclaim our viewers," she said. Sweeney said ABC made history when it agreed to make its content available on Apple’s iTunes service. Learning from the mistakes of the music industry, the network understood that this distribution route would not cannibalize its content’s value, but rather enhance it. "iTunes created a new revenue stream for our content," Sweeney said. Disney will continue to test and experiment in an effort to discern viewers’ preferences, Sweeney said. She described a planned ABC.com project during May and June in which episodes of popular ABC programs will be offered as free streams – including three required-viewing ad breaks. "These emerging platforms aren’t ‘alternate,’ they’re additive," she said. Sweeney acknowledged that the path from traditional broadcasting to today’s divergent distribution was a challenging one. "We don’t have all of the answers, but we’re committed to working with our affiliates for the answers," she said. "I like the fact that old media is leading the way into the future." In the lively panel discussion that followed Sweeney’s address, moderator Tony Kern of Deloitte & Touche led industry luminaries through the maze of issues facing both networks and affiliates. Larry Kramer, president of CBS Digital Media, advocated experimenting with different ingredients, methods and technologies. "We’re basically trying everything," he said. Kramer described CBS’ experiment with free streams of its 2006 March Madness broadcast. While the 2005 event, which required viewers to pay, drew an audience of 25,000, this year’s Webcast was served to five million viewers, 300,000 of whom signed on the first 15 minutes of the telecast. Kramer felt the CBS broadcast audience hadn’t been compromised by the move. "Who wouldn’t rather be watching at home on a 50-inch plasma?" he asked. Instead, the Web feeds reached viewers who would otherwise have missed out on the network telecast, and the numbers bore out that hypothesis, revealing the highest ratings for that event in eight years. Hams in Germany received signals from American spacecraft Voyager 1 March 31 using a 20 meter parabolic antenna of a radio telescope on a frequency of 8.4 GHz…. A team of hams at AMSAT-DL/IUZ Bochum (The Institute for Environmental and Future Research at Bochum Observatory) using Doppler shift and sky positioning, received the signal from a distance of 8.82 billion miles (14.7 billion km). That’s roughly 98 AUs, or 98 times the distance from the Sun to Earth. This is the first recorded reception of signals from Voyager 1 by radio amateurs…. Voyager 1 was launched in September 1977 to conduct close-up studies of Jupiter and Saturn, Saturn’s rings and the larger moons of the two planets. Originally built to last only five years, the probe will continue to send back astronomical information to NASA and the JPL until at least 2020. Voyager 1 will continue to study ultraviolet sources among the stars, and the fields and particles instruments aboard will continue to search for the boundary between the Sun’s influence and interstellar space. Communications will be maintained until the nuclear power sources can no longer supply enough electrical energy to power critical subsystems. The achievement by the German hams makes Satellite Radio seem déclasse. IPTV and mobile TV are to this year’s NAB convention here as HDTV was a decade-plus ago. "You can’t walk on the [NAB show] floor without hitting your head on IPTV," said Sebastian Moeritz, pres. of the MPEG Industry Forum, which is working with the Internet Streaming Media Assn. (ISMA) and others on IPTV (Internet protocol TV) specifications and standards. The U.S. market for mobile TV is "huge," said Michael Schueppert, pres. of Modeo, now running a mobile TV trial in Pittsburgh. He said initial data indicate at least 10% of U.S. cellphone users will add mobile TV capability the next 6-7 years. Schueppert said that could mean about 20 million U.S. mobile TV users, "substantially more" than today’s total of XM and Sirius users….. WHEN STEVE JOBS announced last fall that iTunes fans could buy episodes of Lost and Desperate Housewives for $2 a pop, a market for portable TV shows emerged overnight. And services like MobiTV and Verizon’s Vcast let cell phone owners watch TV on the go. If your eyes can handle TV shows playing on screens as small as an inch on the diagonal, MobiTV’s $10-a-month service (available in the United States on Cingular, Sprint, and a few regional carriers) streams content from CNN, MSNBC, and other stations to a supported handset. Verizon’s $15-per-month Vcast lets you watch live TV, but only on phones that support Verizon’s high-speed EVDO wireless service–and only in markets that offer it. Cingular recently announced plans to offer 18 channels of video as part of its $20-a-month Media Net package. The service will include 3- to 5-minute clips from popular programs such as King of the Hill and That’s So Raven. We’d love to hear about cool things you’re seeing at NAB. Tell us what’s going on (besides losing the nest egg) in the comments below. Remember Sixteen Candles, the 1984 John Hughes film featuring Molly Ringwald and Anthony Michael Hall? Hilarity ensued, as they say, when Ringwald’s film family forgot her sixteenth birthday. We’re thinking of the film as we realize we missed an important date yesterday– the sixteenth anniversary of the launch of the Hubble Telescope aboard the space shuttle Discovery on April 24, 1990. To celebrate the birthday, NASA and the European Space Agency (ESA) have released a "mosaic image of the magnificent starburst galaxy, Messier 82 (M82). It is the sharpest wide-angle view ever obtained of M82, a galaxy remarkable for its webs of shredded clouds and flame-like plumes of glowing hydrogen blasting out from its central regions." Here’s an interesting tidbit from behind the Wall Street Journal’s subscription wall. MobTV is getting another foothold stateside. Satellite operator SES Global S.A., seeking to find a place in the burgeoning wireless-entertainment arena, today is expected to announce it is joining with a start-up company that controls a big swath of mobile broadcast spectrum across the U.S.
… A yearlong test is planned to begin this fall in Las Vegas, though negotiations with programmers and leading cellular providers still have to be worked out. The plan is the most ambitious yet to test such a system using fewer transmitters, or towers, to simultaneously distribute as many as 40 higher-resolution video channels directly to handsets. Implementing the concept would end up costing a small fraction of the estimated billions of dollars necessary to build out rival networks relying on less-powerful broadcast signals and thus requiring towers spaced closer together. Multichannel News has a bit more, no subscription required. It’s encouraging news, after my previous post on mobTV spreading in Korea, across Europe, and into Canada and North America. It’s also encouraging that, after re-reading my post on how mobTV works, I think I get how the Las Vegas project is gonna work out. I’m guessing the involvement of a satellite company means using a satellite signal to cut down on spectrum issues like the ones covered in my previous post. So, this sounds like a wish fulfilled. I just hope that the tag line from those edgy and ubiquitous Las Vegas tourism commercials doesn’t hold true for this latest stateside foray into mobTV. Back to robots for just a minute. I mentioned the pregnant robot earlier, the one used to help train medical students without the need for human guinea pigs. I also blogged about the challenge of meeting medical needs in space. Well, those topics have come together in a pretty interesting way. With help of a NASA robot, emergency surgery in space may have just gotten a lot easier. Using a cramped undersea laboratory off Florida’s Atlantic coast, NASA astronauts and medical experts have teamed with an experimental robot to demonstrate long-distance surgical procedures that might one day save the life of a critically injured explorer on the moon or Mars. The mission to evaluate a new branch of health care called telemedicine and the use of robots in surgery will draw to a close today when the three-man, one-woman crew leaves the research facility 62 feet below the water’s surface where they have lived since early this month. During their stay aboard the 43-foot-long Aquarius, submerged among the coral reefs off Key Largo, Fla., physician Tim Broderick and three astronauts — Dave Williams, Ron Garan and Nicole Stott — assisted as Canadian surgical researchers 1,250 miles away sent commands to a robot inside the laboratory. Responding to those commands, the portable robot sutured a badly damaged vein in the wounded arm of a patient simulator, a lifelike medical teaching aide constructed of rubber and fabrics that mimic human tissue and contain bloodlike fluid. "Patient simulator"? "Lifelike medical teaching aide"? Is it me or does that sound like a robot doing surgery on a robot? I guess it’s better that way, as long as they’re experimenting, but I supsect they won’t get any notes about cold hands or bedside manner from a "lifelike medical teaching aide." "Nearly 60 years after Thor Heyerdahl’s Pacific Ocean crossing aboard the balsa raft Kon-Tiki, a Norwegian team is in Peru putting final touches on a new vessel to repeat the journey," the AP reports. The original Kon-Tiki in 1947. "I think we are mentally prepared and we are really, really anxious to put this raft in the ocean," said Olav Heyerdahl, 28, the adventurer’s grandson and one of the six-member crew. Behind him in a dry-dock in Lima’s port of Callao loomed the balsa raft Tangaroa — named for the Polynesian god of the ocean — which is scheduled to set sail April 28. The expedition had been set for last year, but was postponed after key sponsors diverted funds to help victims of the 2004 Southeast Asian tsunami. In 1947, Thor Heyerdahl and his team sailed their primitive raft 5,000 miles from Peru to Polynesia in 101 days to support Heyerdahl’s theory that the South Sea Islands were settled by ancient mariners from South America. Heyerdahl, who died in 2002 at age 87, documented his voyage in the best-selling book "Kon-Tiki" and in an Oscar-winning documentary film. The adverturer’s 67-year-old son, Thor Heyerdahl Jr., came to Peru to see the new vessel and cheer on his own son. "I’m very happy for him that he gets this opportunity," he said. The new 56-foot vessel is larger than the Kon-Tiki, with eight crossbeams lashed to 11 balsa logs from Ecuador and covered by a bamboo deck. Atop a hardwood cabin, the crew fitted a thatched-reed roof made by Aymara Indians. The Kon-Tiki carried only the most basic equipment, even by 1947 standards. But the Tangaroa features abundant modern technology, including solar panels to generate electricity and satellite navigation and communications gear. We’re not sure if the expedition has Internet access while adrift in the South Pacific, but it is possible if they contacted Connexion by Boeing, which uses SES-Americom’s AMC-23 satellite, which is the only satellite that they can use for Internet based on their route. Consider that a modern factoid for an ancient journey.